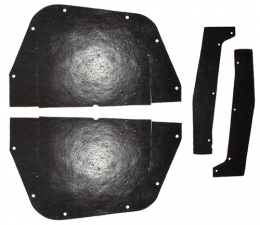 A arm dust shields. Die cut from original style masticated rubber for a factory fit. Pieces fit over a-arms, inside front inner fenders. 4 piece kit. Order our 19-013F fastener separately. MADE IN THE USA.